Vanhang and ITCA who are looking forward to welcoming you to Longcheer! Are you packed for your Topper Worlds Adventure yet? This will be, I think, the last newsletter from ITCA before you arrive in China! You'll probably breathe a sigh of relief to hear that, as it's a bit long and not as illustrated as others... sorry! But I believe this is the level of detail that everyone would like to see? Apologies if some information has been repeated, We are just trying to collect it all in one place! 1. The sun is very strong, so bring good sun protection! 2. Drink plenty of water! There will be water stations throughout the venue. 3. Although it is very hot in Longcheer it frequently rains, so please bring an umbrella. Locals also use their umbrellas to protect them from the sun. 4. Please notify your bank that you will be travelling abroad, so that you can use your Credit Cards. 5. Get Chinese Yuan (RMB) as you will have to pay for some items and services in cash. 6. Competitors should bring their own buoyancy aids if they can. There will be buoyancy aids available but they may not have pockets or be the style you prefer. 7. You should talk to your Doctor before travelling to check vaccinations and any medication. 8. Internet access is restricted in China. 9. The people in the area are very polite and are delighted to meet westerners. Try to speak Chinese; even a simple ‘Nee-How’ greeting elicits a BIG smile! ITCA and Vanhang would like to invite each country to put on a small ‘act’ that reflects their country and culture on the evening of the Event Meal. In 2017 China put on a fantastic show for everyone and we hope that other countries will want to repay that compliment. A series of performances were also held at the Topper Asians in December and the evening was a great success. This could be a dance, a song, a poem, a reading, an instrument, whatever you like. It would be really nice to have participation from as many countries as possible! It does not have to be too serious; let’s face it - the GBR contingent in December performed the ‘Chicken Dance’ and got a huge round of applause. Perhaps this is something to discuss with your team on the plane? It would also be great if you could bring your country's flag, to give your country the most publicity possible! 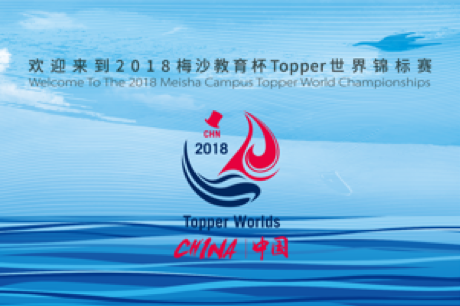 There are 264 entries at the time of writing, and this will be the largest and most international Topper World Championships in history. Our Commodore, Bill Brassington, has been working hard to make the reimbursements for the Visa Grants, and the majority have now been paid. Bill will not be able to make payments while he is in China. Receipts are necessary for reimbursement. Electronic applications only will be accepted, and not paper receipts/copies at the event. Any received after August 12th are not likely to be paid until September. The same applies for any travel grants that are due. Volunteer to help onshore and on the water! We always need help! Volunteer lists will be available at registration – please sign up to help if you can! Please see Michelle Hill, International Secretary, for further information. August is one of the warmest months of the year in Shenzhen. Temperatures range from 25 to 35 degrees C.
It is humid and it can often rain. Please notify your bank that you will be travelling abroad, so that you can use your Credit Cards. The local currency is RMB (Chinese Yuan). The current approximate exchange rates as at 3rd August 2018 is 1 Yuan = £0.11, or 1 Yuan = US $0.15, or 1 Yuan = €0.13. Please check for yourselves though. We would recommend that you get RMB from your bank, post office or local equivalent before departure or exchange at the airport on the way out, at least for the first few days of your stay. In Hong Kong airport we could only exchange with cash, and the rate was poor. Please check with your individual bank regarding any possible charges for using your credit / debit cards in China. Travellers Cheques are not used in China. RMB can be used by some shops in Hong Kong airport, but not all of them. Credit cards can be used in Hong Kong Airport. The maximum RMB to be brought legally into the country is 20,000 RMB. The nearest ATM we found was in Dapeng which is a 20 minutes bus ride away, and we will be running regular shuttle buses to and from Dapeng. You will pass through Hong Kong security before collecting your bags. They are very health conscious and so there is a large camera which checks for people with a higher than normal temperature; you may be taken aside to have your temperature taken individually (just an infrared tool directed at you, not actually touching you). You will find a meet and greet team from Vanhang at Arrivals area A. You will have been notified by Vanhang of your transfer time. Please meet them at the Pret-A-Manger in Arrivals Area A, where there are lavatories, money exchange and a seating area. If you are on the pre-tour of Hong Kong, Travel Counsellors will have a different sign for you. Transfer buses will be air conditioned but without lavatories. Bottled water will be available on the bus. It takes approximately 2 hours to drive to Longcheer Yacht Club, broken up by a border crossing. In order to cross the border, you will have to disembark the bus and put your luggage through a security machine. You will present your passport to immigration and will have virtual fingerprints taken by a scanner, as in many other airports around the world. None of this takes very long. Border crossing forms from Hong Kong to the Republic of China will be provided to you on the bus. Address: Vanke Longcheer Hotel, Longcheer Yacht club , No.12, Xin Dong road, Da peng Xin qu, Shen Shenzhen, Guang dong. When you arrive at the hotel, one member from each family should go to reception with passports for the whole group and credit card, and they will check in for the whole family. We have just been advised that the hotel rooms must be paid for on arrival, which will speed up departure due to your post tour timings. This is payable by credit card or RMB cash. There will be English speaking volunteers from Vanhang Sailing in reception to help provide information to guests, and sign post to bike hire, the fishing village and local buses. Hotel plug sockets – we believe they accept European, USA plugs and AUS plugs, but please bring an adaptor. However, we understand electric socket adaptors may also be available for purchase. Kettles, fridges and toiletries will be provided in all rooms. There will be a café selling tea, coffee, cakes etc for both guests and families in the hotel. There will be WIFI in the hotel. Should you have any queries, need help or have problems at the hotel, please deal direct with the hotel team. The hotel serves both Chinese and western food. Residents of the hotel have breakfast included in their room cost. Lunch and dinner taken at the hotel should be paid for either in cash (RMBs) or by credit card at the time of purchase. It cannot be added to your bill. Evening meals at the hotel will be about 128 RMB per meal. There will be different buffet each night. Lunches will be approximately 80 RMB (also buffet). Sailors, officials, translators and volunteers are entitled to a free lunch on the sailing days (not lay days) and will be given passes. If there is a "non-sail" day or a delay to sailing etc, sailors, officials, translators and volunteers will still be given a packed lunch. However, if you wish to go to the restaurant for lunch it will be charged. Bespoke on-water lunches for sailors with pre-notified allergies will be provided. In all cases any drinks, both alcoholic or non-alcoholic, need to be paid for at the time of purchase. Water will be provided. Food is very reasonably priced. Most restaurants outside of Longcheer do not accept credit cards unless they are from a Chinese bank, so take cash. Lunch prices in the fishing village (20-minute walk) are approximately 50 RMB per person. We are advised that evening meals in the fishing village are inexpensive at approximately 80-100 RMB pp (excluding drinks). We paid 408 RMB for an evening meal for 3 in the town. Practice using chopsticks! Many restaurants do not have forks and knives unless they are quite upmarket. Might be “BYO fork” if you have trouble using chopsticks? If you like salt and pepper you might be better to bring your own. Meat is often served on the bone – fish, chicken, etc. The chicken is often cut into chunks and locals chew the pieces and then spit out the bones. It is all quite ‘freestyle’. Although we found most restaurants give you serviettes, you may want to bring extra serviettes or tissues with you just in case they are not supplied. Eating with chopsticks can be messy and fun! In supermarkets there are a lot of foods that are very similar to western products, but with different labels. There are many western brands available too – just look for the logos! Milk is available in all types including cow’s milk, soy, UHT etc. Squash is not available in China. If you have specific items that you actually need e.g. particular cereals, bars, etc, please do bring your own. However, the choice in the supermarkets is very extensive. We are not aware of any restrictions on bringing food into China. You may wish to bring extra tissues in case you need to use local toilets. This will be warm weather sailing, so rash vests, lightweight hikers, light spray tops, gloves and boots are recommended. Long sleeve rash vests have the added advantage of shielding from the sun. Aquafleeces should not be required. It is recommended that you bring your own buoyancy aids. Rooster has recommended an ideal range of products for use in China, available from www.roostersailing.com. Mid Layer: Pro Rash Legs OR Thermaflex LongJohn 1.5mm. Both these products can use the Rooster Pro Hike Pads. Base or only top layer: Long Sleeve Rash Vest or Thermaflex Top 1.5mm. Footwear: Pro Laced Boots with a pair of Polypro Socks. Competitors should register in the hangar on Tuesday 14th or Wednesday 15th August, times to be confirmed. We will endeavour to open registration on earlier days if possible. ITCA would also request that you to sign a GDPR form, if you are happy to do so. This would allow photographs and films of the event to be taken and used to promote future Topper World Championships. Competitors will be allocated their boat and given a check sheet. Go to your boat, check it and then return the check sheet. Then pay the deposit of 1500RMB in cash. Credit cards will not be accepted. If you are not going on the post tour please see * below. By the way, please make sure that you always return your boat to its designated boat space daily. Competitors will be issued their entry packs at registration. If there is no issue when the boat is returned at the end of the championships, you will get a full refund. If there is an issue with your boat, there will be a discussion and Vanhang will work out how much is owed and it will be deducted from your deposit. If you notify Clive at Vanhang before Friday 10th August, you may pay the deposit in the £ Sterling in cash = £170 at today’s rate. Cheques will not be acceptable. If there is damage to the boat Vanhang will work out how much is owed (RMB or Sterling at that daily exchange rate), and it will be deducted from the deposit. Minor amounts may be paid in RMB which can be used at the airport. Measurement will be conducted on Tuesday 14th and Wednesday 15th August, times to be confirmed. We will endeavour to open measurement on earlier days if possible. Measurement will be in Longcheer hangar, where the mast can be raised and it is out of sun. Official offices will be situated below the camp rooms, next to the shop by the hotel. The Official Notice Board will be located by the offices. This will also be the location of the International Secretary and Results. Tallies must be used for this competition for safety reasons. Tally in and out through the central tent. Anyone with allergies or a medical condition will be given a red band to identify them. Competitors will hand in their pass accreditation in exchange for their tally. When tallying off, competitors will also collect their drink/snack from this tent after racing. Officials, volunteers and translators will also collect their on-water lunches from the restaurant area. Ashore volunteers will also collect their food from the restaurant area. Please always return your boat to where you first collect it. Launching will be down the 2 slipways. All water sports hire, shuttle bus bookings, and local information will be provided by Longcheer staff and managed through the Tally Tent. Russ Dent, from Topper International, will be onsite for the duration of the Worlds. There will be a boat repair area next to the Measurement area. If you have chartered a rib, it must be paid for in RMB cash. Fuel must be paid for in RMB cash as well. The Opening Ceremony will be Wednesday 15th August at 18.30. There will be a buffet for competitors included as part of the entrance fee. Extra tickets can be purchased at hotel reception. The Mid-Championship Meal will be on Saturday 18th August. We would like each country to put on a small ‘act’ that reflects their country and culture, as mentioned above. Chinese competitors will also be putting on a show. There will be a buffet meal. Competitors receive a ticket for this meal included in their entry fee. Additional tickets for the special event meal are available to purchase at 168 RMB per person, with a discount for children, from the hotel reception. 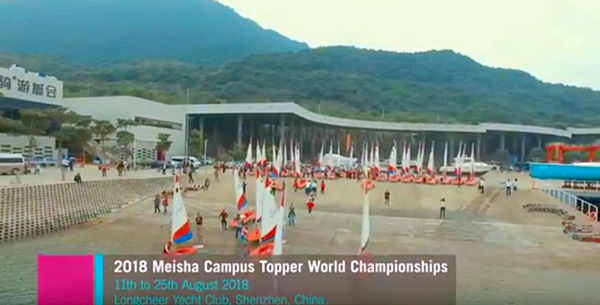 The closing ceremony will be Tuesday 21st August at approximately 18.00 (the exact time will be determined on the day depending upon racing and conditions). There will be a buffet for competitors, included as part of the entrance fee, and extra tickets will be on sale at hotel reception. At Lavenna Hotel next door, a short walk away, there is a swimming pool (the Longcheer hotel pool will not be operational). You can buy tickets at the Lavenna pool. The price will be around 50RMB per person per day. This price will be dependent upon significant numbers of people wanting to use the facility. There is a bar available at the Lavenna Hotel as well. There is a beach adjacent to the boat park as well. Please bring your own beach towels – or purchase in a supermarket when you arrive, at approximately 45 RMB. 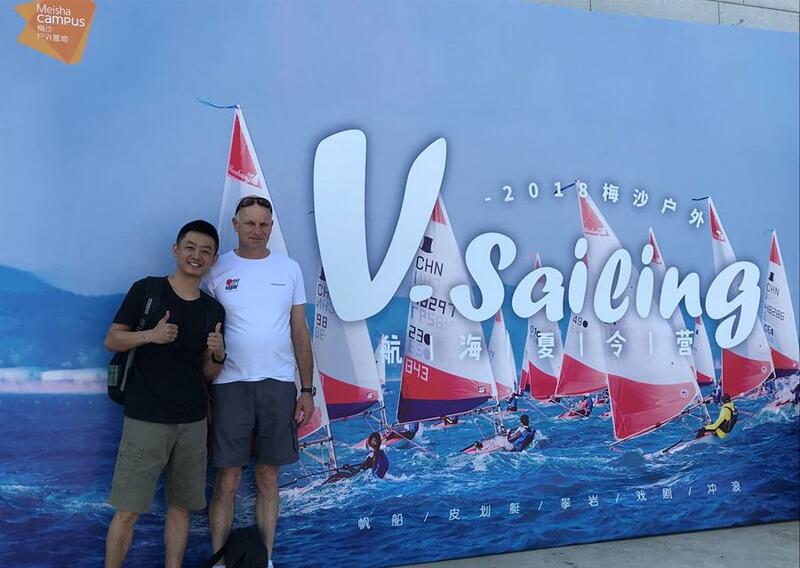 SUPbBoards, kayaks and other watersports equipment will be available for hire through Vanhang Sailing. Windsurfers can be hired from Unione, which is on site. Details on prices are to be finalised. The tennis courts and the climbing wall at the hotel are finished and should be available. Bikes are available for hire just a short walk from the hotel. You can get directions from the hotel reception. Tickets for places on spectator boats will be available for purchase at the hotel reception. Optional excursions may be arranged to the Geopark and Dameisha if the demand is there. A 32-seater will do shuttle runs to and from DaPeng, daily from 16th to 21st August inclusive. In the morning it will depart from the hotel at 10-10.30am, then return 11.30-12.00. In the afternoon the departure will be 13.30-14.00 depart, returning 16.00-16.30. Between these times you will need to get a cab. The Departure Point is to be agreed. The Collection point will be by McDonalds in DaPeng. The people in the area are very polite and are delighted to meet westerners. Try to speak Chinese to them; even a simple ‘Nee-How’ greeting elicits a big smile. You may get some stares as western faces are less common, especially if you have light hair or eye colour. Some toilets when you are out and about may be ‘continental style’ e.g. without a seat and without toilet paper, so maybe carry extra tissues to be on the safe side. The crime rate in the area is minimal, with many westerners expressing the sentiment that they feel safer in China than they do in their home country. Tipping is not customary and in fact sometimes staff will come after you to return a tip. Bartering is not customary in southern China (where the Worlds are) but is in northern China. Please note for those on the post tour. At zebra crossings, be cautious. You should assume cars have the right of way, not the pedestrians. Stand on the edge and do wait until cars stop for you. If you regularly use inhalers, epi pens, pain killers or other, ensure you bring them with you. It might be useful to bring a doctor’s note if bringing large amounts. There is a good chemist in Dapeng (and some stuff in the supermarket) but no English translation on the box, so care is required. Mosquitoes are prevalent in the evening in August, so some preventative supplies required. If you want advice talk to your Doctor. You should talk to your Doctor before travelling to check vaccinations and any medication. Internet access is restricted in China. Some use VPNs to get around this but they are illegal in China, and there is some concern by the club about large amounts of people using VPNs in one location. Messenger, WhatsApp, Facebook, Google, etc do not work. Microsoft Translator is also very helpful. We are really looking forward to welcoming you in Longcheer. If you have any queries please contact the International Secretary, Michelle Hill, who is happy to help, but will be travelling out on Tuesday into Wednesday! Have a safe journey, and see you soon! The newsletter for Topper Sailors, supporters and fans worldwide.